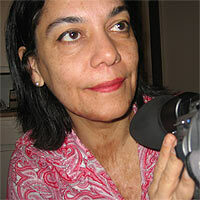 Tânia Cypriano has been creating media in the United States and her native Brazil for over 15 years. Her films and videos have been screened internationally at the Museum of Modern Art in New York, the Jerusalem Film Festival, the Amsterdam Documentary Film Festival, Rock in Rio and the Berlin International Film Festival, and won Best Documentary at the Joseph Papp's Festival Latino in New York, the Pan African Film Festival in Los Angeles, and the Festival do Cinema de Gramado in Brazil. Cypriano's television credits include documentaries for PBS, the History Channel, NHK in Japan, GNT in Brazil and Channel 4 in England, and she has been award grants by the New York State Council on the Arts, the New York Foundation for the Arts, the Soros Documentary Fund, The Ford Foundation, the Jerome Foundation, and the National Latino Communication Center. Recently she worked as Line Producer on Lady by the Sea, a one-hour documentary about the Statue of Liberty, written and directed by Martin Scorsese and Kent Jones, as well as working on Premiere Brazil! at NY's MoMA, a showcase of contemporary Brazilian cinema curated by Ilda Santiago and Jytte Jensen.